I recently had some photos taken by a professional photographer, Kevin May, who lives here in Peoria. I was overawed at his setup and enjoyed a chance to see how he went about everything. Hopefully I can use some of what I learned to take better photos for this blog. 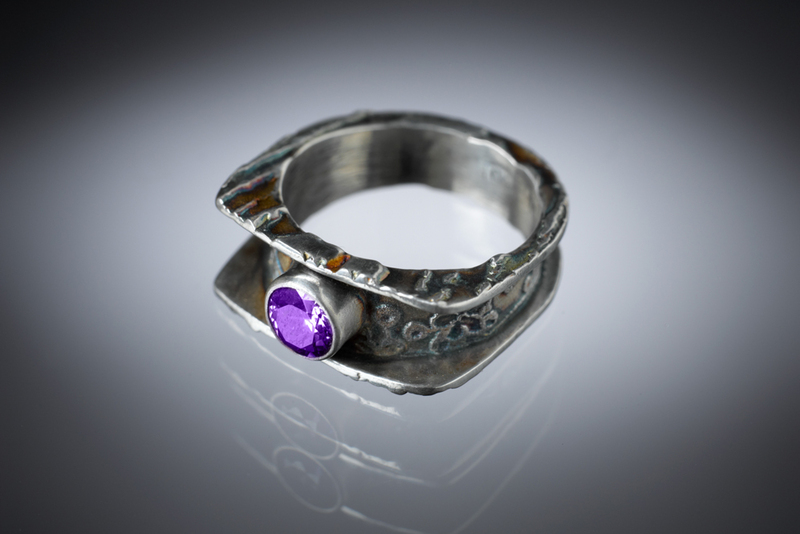 This ring is fine silver with a purple CZ set in a tube. I learned quite a bit from creating the tube setting from metal clay. The stone sits ever so slightly off from level post firing. I do not believe the angle of the stone is all that noticeable but I am after all a perfectionist. I have no good ideas about how to prevent another stone from shifting during firing. The setting involves two metal clay tubes of different diameter. After both tubes were perfected I sanded the bottom edges into a slight curve so that they would sit nicely onto the curved ring band. The inner tube acts as a seat for the stone and the outer stone captures the stone. I sanded the top edge of the outer tube to bevel it so that after firing I could press it down a bit to create a neat look. The ring size shrank quite a bit so I sanded out the edges of the box to make them flush with the inner band, which is a design change and which gained the ring over a whole size. I was shooting for size 7 so I had cut the sides as a size 9 and then after drying and sanding smooth they were about a size 9.25 so I was very happy with this but post firing they fitted my sizing mandrel as a size 5. Metal clay shrinks in strange ways sometimes when you build boxes. After sanding flush the ring is a 6. The shape of the ring would make it difficult to beat on a mandrel to make it any larger but in theory the ring could be stretched but I do not plan to try. I am thinking about using ring plugs more often since I have had several rings shrink well past the size I had planned. This photo is also taken by Kevin May. I have created a series of 4 pieces with a seasonal theme. 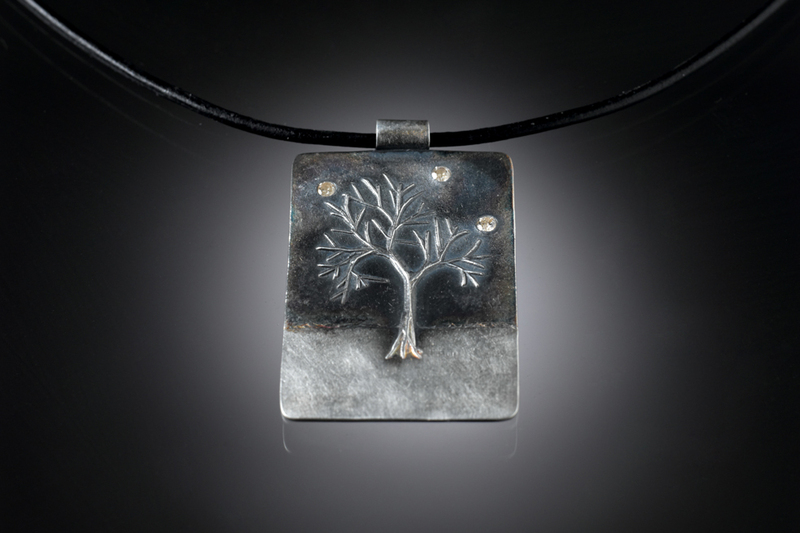 This piece is winter and depicts a naked tree in a stark winter nighttime landscape. I applied patina to the night sky and some of the solution may have crept under the stones which makes them look cloudy. I am not sure how to remove the residue without damaging the patina. So this piece is not ready for sale until I work out how the stones can look sparkly and the background can look dark at the same time. I have many more photos to work with now and am quite excited to post them over the coming weeks. If any of you are interested in Kevin’s photography here is his blog. He is quite well rounded, having done a lot of work for Caterpillar and also landscapes and macro photography. Lovely ring very very professional photograph. Look stunning with reflections. WOW!